LynchyRightNow: From Ashes . . . He has risen like "The Greatest Clutch Hitter In Red Sox History." You call it cliche, call it used up, I'll refer to it one way: Bone Chilling. Those are the only words which my vocabulary can pull togeter to describe a swing of the lumber, turn down the lights, walk off homerun from David Ortiz. Written off by many, including myself, and still David Ortiz wraps a game winning homerun around Pesky Pole to close down The Fens for the evening. The Red Sox designated hitter has gone through the most trying of big league seasons in his 12-year career. Nearing two months into the season before David Ortiz blasts his first homerun of the year. Two weeks before his second dinger reaches the cheap seats. Was David Ortiz just finished? Were the injuries to much to return from? Had David Ortiz gotten old that quick? Was this the deteriorating of our legend in the making? Then the shoe drops. David Ortiz included in the now famous steroid testing of 2003? Was this unreasonable Red Sox fan hell? Believe it. How do you move forward Big Papi? Ortiz' struggles at the plate continue and fans are becoming inpatient. Management brings in multiple first base/DH types to boost a hurting Red Sox lineup. Could things get worse for the one they call Papi? with a slight lead. The once left for dead superstar has rebounded over the past three months clobbering 22 homers and 70+ RBI. It is more than fitting that we celebrate the first walkoff homerun from David Ortiz since 2007 on the day Massachusetts honors it's greatest political icon of the past 50 years. Senator Kennedy's passing reminds us of a man who despite the setbacks both personal and professional, despite the negativity and the naysayers, you can push past that and remind everyone what you are capable of. Not many politicians could move through their issues, some brought on by their actions and some not, but Senator Kennedy could. David Ortiz was in the midst of his most trying season by far, the events of the past seven months have not been kind to our once seemingly stainless slugger. However on the day we mourn the loss of a great inspiration like Edward Kennedy, we watch that larger than life grin go across David Ortiz' face as he crosses homeplate in victory. I'm not so calais to compare leaving the scene of a fatal accident to being accused of using performance enhancing drugs, that wasn' the point. The point is to watch David Ortiz and Senator Kennedy both rise froms trials and tribulations to succeed on a larger stage. I want to take time to both recognize our great Senator and also remind fans that David Ortiz isn't done just yet, as far as counting him out goes? I won't do it again. 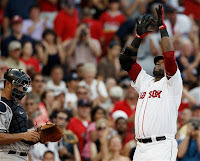 David Ortiz rises from the ashes, and my hat goes off to that.